We are excited to announce that Developmental Medicine & Child Neurology has accepted our final draft of our Research CP manuscript. Final publication date is not exact but likely by late August. In addition, the American Academy for Cerebral Palsy and Developmental Medicine (AACPDM) sponsored the publication for public access meaning that everyone will be able to read the manuscript in full. This milestone is a tremendous accomplishment for the cerebral Palsy (CP) community. It gives voice and weight to the research questions that are the most pressing for the community. 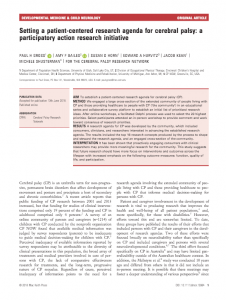 The Research CP process, funded in part by the Patient Centered Outcomes Research Institute (PCORI), engaged a broad swath of members of the extended community with CP including not only people with CP and their caregivers but also the clinicians and therapists who treat them. We will provide a notice here when the paper is finally published and provide a link to the text. We also hope to kick off a discussion about how to engage the community in the research itself.